Few events in electronic gaming are as anticipated and over-heated as a console launch. Occurring rarely, the birth of a new system usually gives clues as to where the system is headed during its lifespan. Four years ago, Microsoft entered the gaming community with the original Xbox, an oversized yet incredibly powerful system. The Xbox was able to overcome some initial skepticism and earned a solid reputation for its outstanding Xbox Live service and for bringing PC style gaming to the living room with little compromise. Now, the software giant has unleashed its follow-up, Xbox 360 on the market. Join us as we take an in-depth look at the system and some of its launch software and see what it portends for Microsoft’s second assault. A little over a week has passed since the much-anticipated launch of Microsoft’s Xbox 360. Despite widespread shortages, it appears that the company finds itself in a much stronger position this time around. A more mature machine, the new console immediately makes a statement. 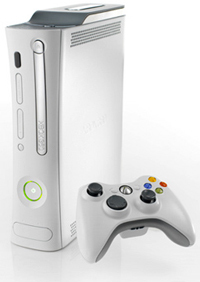 It’s pure white finish draws a stark contrast to the first Xbox, with rounded edges and a smoother face adding to the machine’s sleek, high-tech vibe. It almost looks like an Apple product in many aspects, though the irony probably hasn’t been lost. While the first Xbox slammed its image home with a giant X that dominated the system’s top, Microsroft has taken a more subtle path the second time around, with a smoother, simpler design that’s both elegant and functional. The most interesting aspect of the design is the circle of life, a round globe of light in the center of the machine that lights up, and also indicates which controllers are connected. It might seem like a flashy gimmick, but it compliments the wireless controller’s functionality perfectly. The wireless controllers also help the system look cleaner, since the ports are recessed inside the machine, allowing for a more streamlined appearance. Hiding the USB ports under the hood also adds to the machine’s minimalist aesthetic, giving it’s face a seamless appearance. While in operation, the system radiates a loud hum, which can be frightening at first, but becomes less annoying as time goes around. One mis-step is the large power-brick AC Adaptor, which is nearly as large as the console itself, and is difficult to store in an out of the way location. System aesthetics aside, Xbox 360’s improved controller feels like a simpler, streamlined version of the Controller-S Microsoft released for the original console. Microsoft has improved the placement of the buttons, moving the annoying black and white buttons to the top and relabelling them as back shift buttons, while maintaining the 4 basic buttons on the face. Both Analog sticks have returned in approximately the same location, though they feel a bit sturdier this time around. Unlike the original controller, which featured a large X with no function, the new controller includes a new X button in the center of the controller. This has a variety of uses including turning on the console, and can also be used the call up the Xbox dashboard at any time, even during play. This makes for a much more convenient and high-tech solution and allows you to manage your system effortlessly. The start and select buttons have been moved to either side of the button as well, making them easier to access. Of course, having a wireless controller means that it needs to carry batteries, and the placement of the battery pack on the backside middle of the controller allows it to have a good sense of balance without becoming intrusive or hard to manage. The new controller feels a bit heavier, yet more solid than the Controller-S, giving the player a sturdier grip that doesn’t feel as plastic or flimsy as most gaming controllers on the market. While the controller isn’t flashy and doesn’t rely on cheap gimmicks, its solid form and familiar orientation should make it an excellent evolution of the Xbox controller. While the hardware is solidly and intelligently constructed, the new system’s streamlined user interface is also elegant, and easier to navigate while completely intergrating the machine’s multimedia and online features. Using an intuitive system of blades allows you to quickly move between game, memory and file management systems. You can use and store a varierty of files ranging from MP3 to video and more. The console can interact with a variety of portable devices including i-Pods, digital cameras and even trade files with the Sony PSP using the USB ports. Players can also manage their gamer-tags on this menu and can keep track of accomplishments and tournaments online. One of the more impressive aspects of the system comes when you look at the Xbox Live Blade, and find the service fully integrated and playable from the get go. Signing up to the service and registering your GamerTag should take no time at all, and once connected, you’ll find the service has been fully upgraded with a smoother and even more versatile appearance that’s even more connected to the console experience. As an added bonus, several minutes of bonus multimedia content have been loaded on the 350’s hard-drives, adding value to the system from the start. In addition, Xbox 360’s DVD playback abilities are superb as well, and you don’t need to purchase a special adaptor this time around to play them, which is a plus. Sadly, there are a few problems out of the box that hinder the experience. While the limited backward compatibility was always going to be a negative factor, the machine ships with only two emulators – one for each Halo title. In order to play any other original Xbox game, players have to jump through several hoops such as downloading emulators or purchasing an emulation disc through the Xbox web-site. This shouldn’t be too difficult for most gamers, but is an annoying process nonetheless. All in all, this is a solid launch from a hardware point of view, with smartly designed features and outstanding aesthetics that make Xbox 360 one of the best recent console launches in memory. While the solidly designed hardware is impressive, what most players want to know is how the games themselves look and feel. We’ve played five different games on the 360 and the most important thing we’ve observed is that the game’s visuals are smoother and more polished. It’s not a grand leap like going from the 16 to 32 bit generation was, but there are still impressive featrures evident in the 360’s launch library. The inclusion of Ridge Racer 6 on the console’s roster was probably the biggest surprise, since Namco games have traditionally accompanied Sony hardware launches. While the gameplay mechanics haven’t changed much over the years, the incredibly smooth car models and robust environments are immediately apparent. It doesn’t really show off more than a few lighting effects, but its solid mechanics make it one of the best pick up and play 360 launch titles. While RR6 seems to offer a slightly more polished experience than the last generation, its arcade approach offers a different experience than a true simulation would. Bizarre Creations have filled this void nicely with the latest in their long running, expansive, and brilliant driving franchise, Project Gotham Racing 3. This truly feels like a ‘next-gen’ title showcases the new machine’s added horsepower much more effectively. The visuals are quite impressive, with realistic in-game viewpoints delivering some of the best graphics seen on the 360 to date, with sun glare and dirt reflecting on the windshield. Trackside objects and environments are also slickly designed, and blur the line between rendering and reality.PGR 3’s most impressive feature is the new Gotham TV mode that allows players to compete and view races globally online via Xbox Live. PGR 3’s addictive gameplay remains incredibly deep and satisfying, with the unique Kudos system returning once again. PGR 3’s slick integration between these is the best use of online functionality to date. Both of these racing titles offer a different take on the genre and serve the market nicely for either those looking for a quick adrenaline fix or a deeper experience. 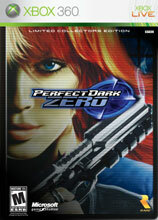 Of the launch titles, none has received as much press or had as much expectation as Perfect Dark Zero. While the long-awaited return of the franchise isn’t “Halo 3,” this is still a solid shooter with elements of stealth and strategy thrown in. An impressive futuristic feel is evident throughout with sophisticated weapons and gadgets that give PD0 a unique feel that builds on its N64 predecessor nicely. The visuals are quite impressive, as you’d expect, and Rare’s gift for creating unique gameplay mechanics is very much in evidence. While the single player mode isn’t as strong as one would like, Perfect Dark Zero offers a solid multiplayer experience that offers some intense arena combat. While it’s isn’t quite as polished or revolutionary as one would expect, this is still a decent launch title. Activision’s Call of Duty 2 is probably the most impressive Xbox 360 launch title, at least from a visual standpoint. The game puts you right in the middle of WWII as a recruit battling the enemy forces throughout Europe . The game’s presentation is simply amazing, with interactive environments, realistic textures and an amazing cinematic approach that brings the battlefields to life. This FPS only falls slightly flat with its simplistic play and predictable mechanics. That said, COD2 is probably the most immediately exciting launch title on the system and definite must if you want to show off the system’s capabilities. Activision has also brought another Xbox tradition onto the new platform – the PC Port. Despite the negative connotations this might bring to mind, Id’s Quake 4 makes an impressive appearance, with its solid engine and detailed graphics transferring beautifully onto the new console. 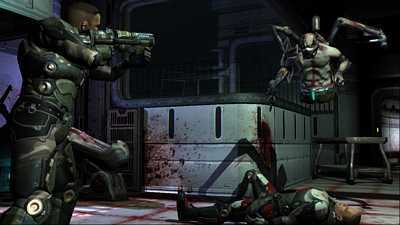 Quake 4 uses the Doom 3 engine, but the added detail allowed on the 360 makes the gameplay shine with little lag or compromise in graphic quality. This is definitely a solid choice for shooter fans who don’t have high-powered PC’s. With a solid lineup of excellent software in the initial lineup, Xbox 360 looks poised to continue and build on the formulas that made the first Xbox so successful. While there isn’t really a killer-app or breakthrough title evident, all the games make solid strides into the next generation with confidence and polish evident. There’s a broad selection of titles available even at this early stage, so the console’s mainstream appeal should be even greater this time around. The hardware is smartly designed and solidly constructed, giving the system a solid foundation that should only grow more impressive as time goes on. It hasn’t been flawless, but the launch of the Xbox 360 can already be categorized as a strong success that makes a strong statement for continued growth by the already well-established company in the gaming market.